This article was written by Dr. Valluvan Jeevanandam, for ' Sai Spandan'- an offering to Bhagawan on His 75th Birthday. Dr Valluvan Jeevanandam graduated medical school from Columbia University in NY at the top of the class. Had surgical training also at Columbia University. Became director of the heart transplant program at Temple University in 1992 and stayed there until 1998. The program was the largest in the US for three of those years. He has since moved to University of Chicago where he is the Chief of Cardiac and Thoracic Surgery and Director of Heart Transplant and Mechanical Assist Device. Has the distinction of being the youngest CT surgery chief in the US of any major institution. In this article, Dr. Jeevanandam recounts his experiences of working in SSSIHMS. 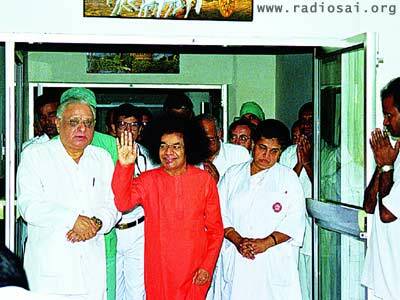 I often get asked what type of hospital is the Sri Sathya Sai Institute of Higher Medical Sciences (SSSIHMS)? Can the equipment match those in advanced centers around the world? What is the quality of the personnel working there? Are they actually doing that many cases? Is the medical care truly free? After being given the privilege and honor of working at the SSSIHMS many times, my answer to all those questions is unequivocal - not only is patient care absolutely superb, but the institution is unmatched by any other in the world. It has the most advanced equipment available - there is barely any difference between working in the operating rooms at Puttaparthi or in any one in the United States. The health care professionals are also unique - most do not have specialized training in their particular field of work. They are a few chosen, very intelligent, devoted students Swami had assigned particular tasks to - and then they received "on the job training." 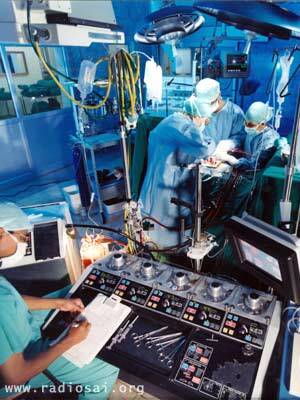 For example, an economics student becomes a perfusionist. Incredibly, they are the best support staff I have ever worked with. They are extremely knowledgeable and devoted to their jobs. They are there for the love of Swami - and it is clearly reflected by their actions and work ethic. Ultimately, SSSIHMS has the biggest advantage over all other institutions - the chief administrator is God himself. How can other institutions match up to that type of compassionate leadership? In the US, we often have to justify what we do for patients. Between the insurance companies and hospitals, financial considerations can often take precedent over patient care. At SSSIHMS, Swami asks that we do our best - He takes care of all the other details. Patient care is paramount as each person is given the most advanced care possible. We have done homograft valves (human valves that are transplanted to replace a patients diseased valve), multiple valves and coronary artery bypass using complete arterial grafts. 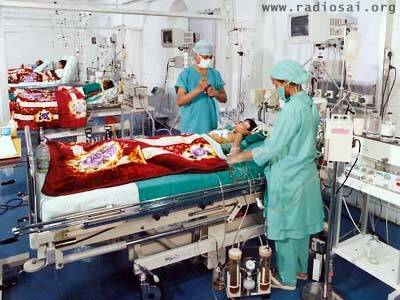 These are procedures done in only one or two centres in India and in fewer than 10% of all hospitals around the world. With Swami's grace, we are able to extend His helping hand and deliver the best care to some of the poorest people in the country. Not only is the care advanced, it is delivered with compassion and understanding. Swami's grace and love is always present. Melodious Bhajans permeate the air. The patients can sense the peaceful bliss. They recover remarkably fast and with few complications. For instance, intravenous lines that are usually required for at least a week are removed within 2 days. On a personal note, being permitted to work at SSSIHMS has changed my outlook on life tremendously. Swami has a great way of using us to help humanity, but equally using His guiding Hand to shape our character. For instance, early in my career, before I was acquainted with Swami's teachings, I considered myself intelligent, technically gifted, and able to save patients who were practically dead. My ego swelled as I began to think that my actions were saving patients lives. One can develop quite a "power" complex. After discovering and being in the presence of Swami, I have realized that this is merely an illusion. An incident during my second visit to SSIHMS really brought this to light. There was one case remaining for the day. It was getting late and the staff wanted to have an educational meeting. Being full of ego, I claimed that the case would be done in 2 hours as I was going to take over. It was a relatively simple case and I could not foresee any difficulties. Needless to say, I was taught a very valuable lesson. The patient developed complications and a short case became a 5-hour exhausting ordeal. The patient ultimately did well but after a struggle. The next day during Darshan, my mind was obsessed with all the difficulties of that case. Swami came over and did not say a word. He just looked at me with a twinkle in his eye and smiled. From that moment, I realised that it was not my ability or talent or intellect. Each one of us put on earth by Swami has a role He has determined for us - we are just instruments of God. With that one episode, Swami sucked out a large amount of my bloated ego. Everything we accomplish is because Swami, in His infinite compassion, wills it so. We have to do our best; the rest is in His hands. That experience humbled me and made me grow up in a hurry. I realize it is not my abilities but rather His Will. Everyday now, I spiritually give Him my patients and He takes care of them - I am an extension of His Hands and just do the duty that Swami has put me on this earth for. If my experiences are any indication, SSSIHMS is truly a Temple of Healing. Not only is there treatment for the patient, but there is also the 'Presence' of the Caregiver as well. Not only is there the repairing of the body, but also that of the mind and spirit. 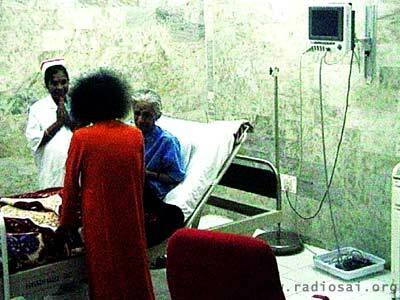 SSSIHMS supplies the best care because it is Swami's care - His selfless love and compassion for humanity. This makes SSSIHMS unrivalled in the entire world.